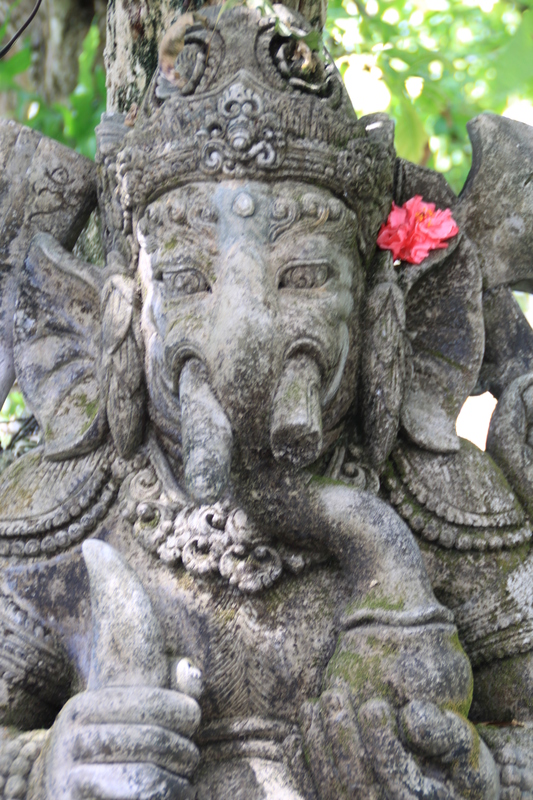 All over Bali you will find the figure of Ganesha. With his elephant head he is very visible and easy to spot. 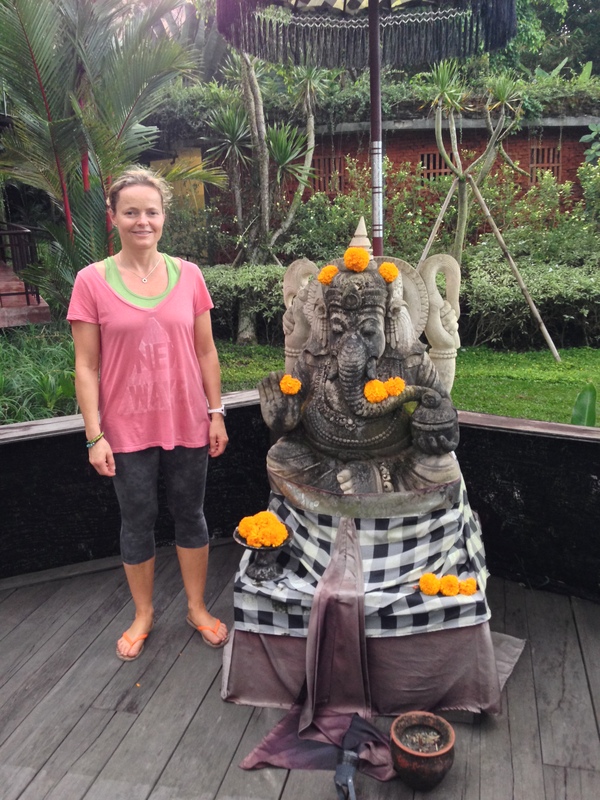 Here is a little wrap up of Ganesha and his story. There are different stories to how he was born or created. Some say he is the child of Shiva and Parvati ( big figures within Hinduism). Other myths points to him being created by Parvati, or the most spectacular one – born from the elephant headed goddess Malini after she drank Parvati’s bath water that had been thrown in the river. I kid you not! 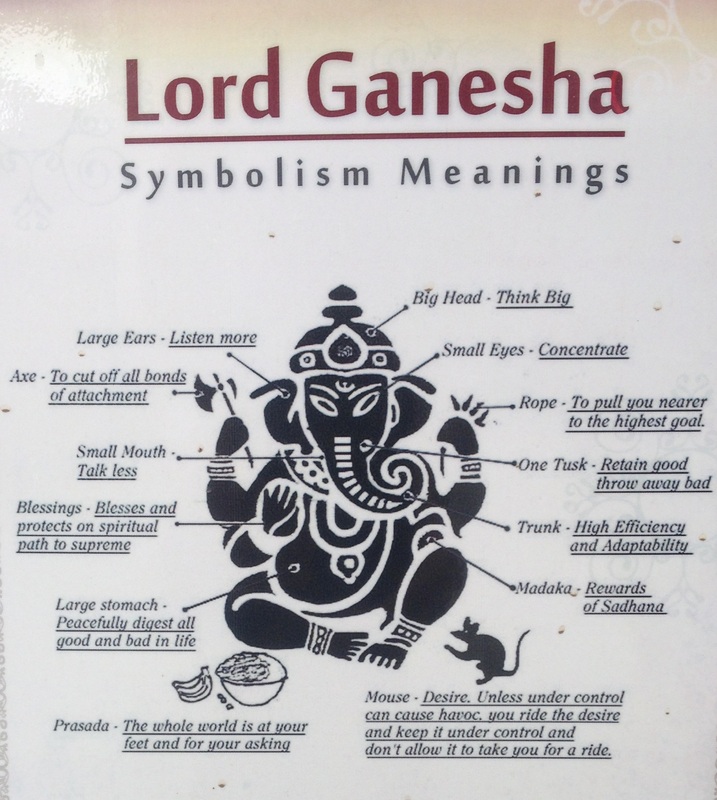 Anyway… Ganesha is said to be the master of many thing. Most importantly as the God of wisdom, knowledge and new beginnings + he is the remover of obstacles. Kind of a cool role to play. All of my friends constantly linking to the Facebook group IFuckingLoveScience should dig this. 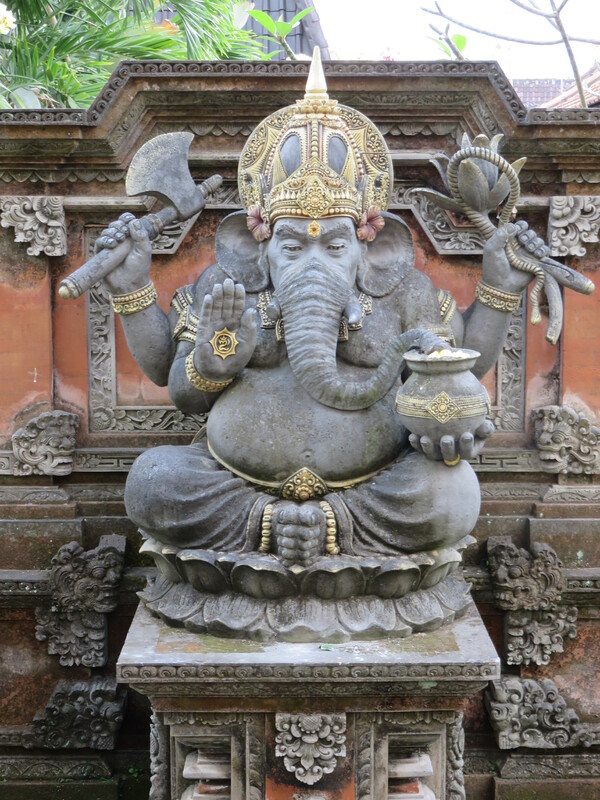 As the patron of arts and science he is one of the top dogs in Hinduism here in Bali. Since he is the God of new beginnings he is often honored in the start of rituals in the temples. The lady we bought the stone figures from said he HAD to be worshiped first. If he did not give his blessing, then the blessings from Vishnu or other gods would not reach you. But as I said, he is everywhere. In basically all properties you will find him in one form or the other. The most commonly scene here is where he sits in lotus position and uses his four arms in different postures. Click on the picture to get a bigger one so you can see one interpretation of him and the meaning of his figure. Personally I like the fact that he is often depicted with a mouse. As the mouse is Desire. Everyone knows elephants are afraid of mice, so Desire has to be controlled, or it will control you. A very cool analogy, in my opinion. 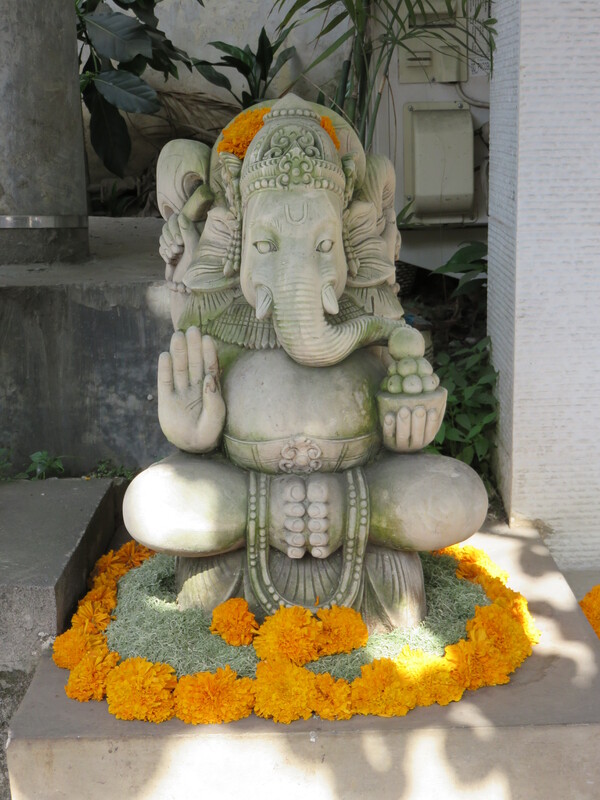 Ganesha emerged as a deity in 4th to 5th century in the Gupta Empire. An Empire that covered most of India, as we know it today. As he was worshipped by travelers and merchants is it natural that he went with them on journeys and got taken in by other countries as Hindus traveled and settled down in Asia. Very influential in Java, Bali and Borneo, and there are traces of him in today’s Afghanistan from the time before Islam rule. I know. It can get a bit pretentious, but I play along since we don’t hurt anyone. Here in Bali in 2014 you will find him on t-shirts, posters, post cards and every other merchandise you can think of. Both Katja and I have gotten ourselves t-shirts 🙂 You’ll find him sitting, lying on his side with his head in his hand as a Diva, or in combination with more humorous elements. We like him, we hope you do to. Categories: Indonesia | Tags: Bali, Culture, Indonesia | Permalink.